Gardening at altitude comes with many challenges, but is balanced by its rewards. Like anywhere, mountain gardeners find both physical and emotional benefits from cultivating food and flowers. Increased exercise, enjoying the outdoors, contributing to a sustainable lifestyle and even learning a life lesson or two are just a few things a garden can provide in addition to fresh vegetables, herbs and beautiful blooms. While these benefits can be attained with a home garden, participating in a community garden provides the added benefit of creating positive social interactions which extend into other areas of life. If unfavorable conditions exist at home, seek out a community-based program near you—like those offered in Idaho Springs, Gilpin County, Nederland, Lyons and Estes Park. Because most mountain residents either don’t have proper space, adequate sunlight or rich soil to garden at home, some of those who like to garden choose to forgo the frustration and simply join a community garden. Several mountain communities offer plots in a central location for individuals to grow their own fruits, vegetables, and ornamental plants in a more social environment. Estes Valley Community Garden is a group of high altitude gardeners dedicated to the opportunity to collaborate and celebrate cultivation of healthy fresh produce while fostering a community spirit. The mission of the garden club is to “enrich individual, social, and environmental health of residents through gardening by providing residents opportunity to play, grow, and gather their own food to be a more sustainable community.” A Raised Beds & Extended Growing Season class takes place, May 13, at the Estes Park Senior Center. Implemented in 2008, Lyons Community garden has received a lot of support bringing the gardening community together. The organic garden, free of herbicides, insecticides and synthetic chemical fertilizers, has 65 sections where locals can garden for only $25 a year. Additionally, the Lyons Garden Club continues its Plant It Forward program to assist Lyons and Jamestown area residents who sustained damage to their flowerbeds from the 2013 flood. In June of 2010, Cameron Marlin, Ursula Cruzalegui and George Marlin saw an empty piece of public land and envisioned a community garden. Starting with a small plot, the garden has grown to offer many plots overseen by a small volunteer committee who also host educational activities, provide educational information to plot renters and are frequently on-site to assist gardeners. Although it was conceptualized as a space for beginning gardeners to learn, experienced folks are also welcome. 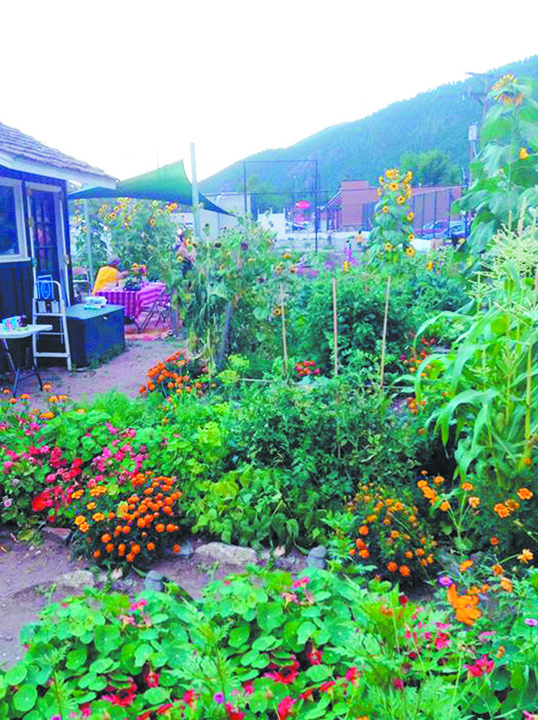 “Currently, Idaho Springs Community Garden provides rentable plots to residents of Clear Creek County, or individuals who regularly participate in the community,” Cruzalegui said. There are two raised beds to provide ADA access to seniors or disabled. The garden also includes three plots for use by a local kid’s program, a shaded communal area, tools, a tool shed, protection from wildlife and an automatic irrigation system. CSU Extension in Gilpin County offers classes and programs on many mountain-related topics including mountain gardening, noxious weeds and more. It oversees the Gilpin County Extension Community Garden at the Gilpin County Fairgrounds. and offers demonstration gardens at the fairground to give ideas on low water plants. Several mountain gardening classes are held in May. Other classes and workshops offered by local CSU Extension offices, local garden clubs and other groups take place in Larimer, Boulder and Clear Creek counties, including, noxious weed classes and Native Plant and Master Gardener programs. Check out websites for more details and an extensive source of high-altitude gardening and property care information. Tags: CSU Extension – Gilpin, Gardening, Idaho Springs Community Garden, Lyons Community Garden, Scraps-to-Soil. Bookmark the permalink.